Strong anti-aging, natural anti-biotic medicine for heart and blood, lowers cholesterol and blood pressure, boosts HDL level, anticoagulant, dissolves blood clots, thins, cleans and builds blood, onion oils block formation of cancerous growths, helps asthma and allergies. An antiseptic, onions can disinfect animal and insect bites, heal mouth sores, poor vision, bloody diarrhea, help sleep, toothaches, headaches, burns, flesh wounds, burns, bruises, hair loss, parasites, and upset stomachs. Has large amounts of sulfur which cleanses the liver and skin, has antiseptic properties and helps build all connective tissue. Aphrodisiac. Increases orgasms. It’s stimulating oils increase the flow of digestive juices creating a greater absorption of nutrients. The sulfuric oils have antiseptic qualities which prevent putrefaction in the intestines by inhibiting the growth of harmful bacteria. Used for athletic performance, anti-bacteria, candida, diabetes, endocrine system, endurance, strength, expectorant, vision and eyes, fungus and fungal infections, heartburn, hemorrhoids, hormones, immune system, insect repellant, joint pain, liver, lungs, mucus, poisoning, salmonella, healthy, glowing younger skin, better sleep, sore throat, stomach cramps, ulcer and cancer, sunburn, teeth, mouth and gums. Onions combine wonderfully with avocados, nuts, seeds and almost any other type of fat or oils. Salads with lots of nuts are good with onions. Many people who live to be 100+ eat onions. Onion juice is insect repellent. 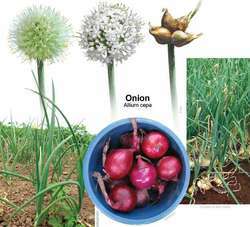 Make sure onion-like plants have onion smell or they may not be onion and poisonous. Evaluation of the cytotoxic potential of water from the river Paraiba do Sul, in Brazil, with the Allium cepa L.
Leaves of Allium cepa were collected from Savar in Dhaka district, Bangladesh during May, 2013. The use of Allium cepa as a test material to examine the effects of eluates and leachates has been further strengthened by this study and also the authors feel the need to prolong the exposure duration from five days to twenty days. Effects of organic insecticides, Kingbo and Azdar 10 EC, on mitotic chromosome in root tip cells of Allium cepa. Treatment effects of onion ( Allium cepa ) and ginger ( Zingiber officinale ) on sexual behavior of rat after inducing an antiepileptic drug (lamotrigine). Also this study demonstrates a protective effect of the ethanol extract of Allium cepa (Onion) seeds for recovery of diabetes and testicular dysfunctions eminent in diabetic state. Finally, the effect of AOPs on cytotoxicity reduction was investigated where maximum degradation was observed using heamolytic, brine shrimp and allium cepa cytotoxicity assays. Analysis of the genotoxic potential of low concentrations of Malathion on the Allium cepa cells and rat hepatoma tissue culture. Induction of chromosome aberrations in the Allium cepa test system caused by the exposure of seeds to industrial effluents contaminated with azo dyes. Antimicrobial activities of Allium sativum, Allium cepa, Raphanus sativus, Capsicum frutescens, Eruca sativa, Allium kurrat on bacteria. Among the top-selling non-silicone options is Merz Pharmaceutical's Mederma Skincare for Scars gel, which contains Allium Cepa, an extract of the red onion. Antimicrobial activity of crude juices of Allium ascalonicum, Allium cepa and Allium sativum.